Chili Beans (i.e. Kidney, Pinto, Vaquero, Rio Zape, etc. 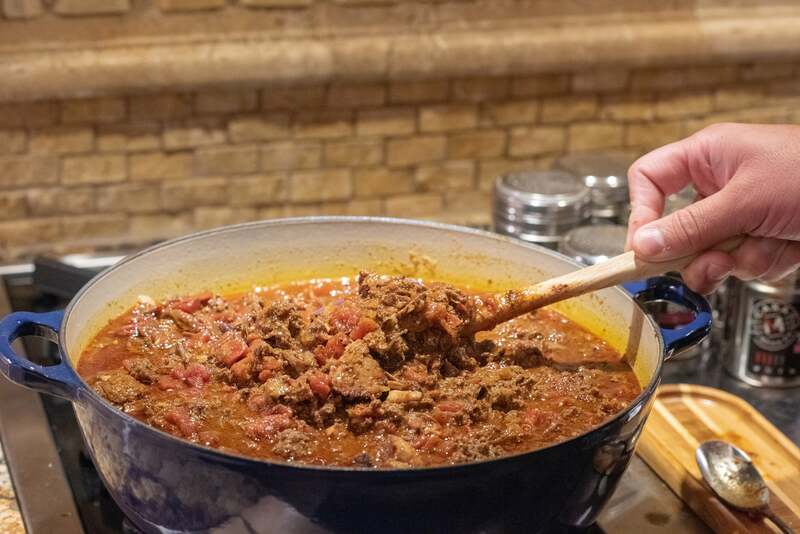 The most important facet of this recipe is giving it time to simmer so that all the flavors have time to develop and blend together. Allow a good 3-4 hours of simmer time in a cast iron pot. Add leftover brisket and ground bison into a large, thick bottomed, cast iron pot. Proceed to brown the ground bison over medium-high heat. Adding the brisket at this stage adds fat from the brisket to help evenly brown the bison since it is generally a lean form of ground meat. Once the bison is properly browned, remove from the heat and cover. In a second pot, add the garlic and diced onions and sauté them over medium high heat until browned and fragrant, then remove from the heat and replace with the large pot of bison and brisket. Add the onion and garlic mixture to the large pot with the bison and brisket and mix well. 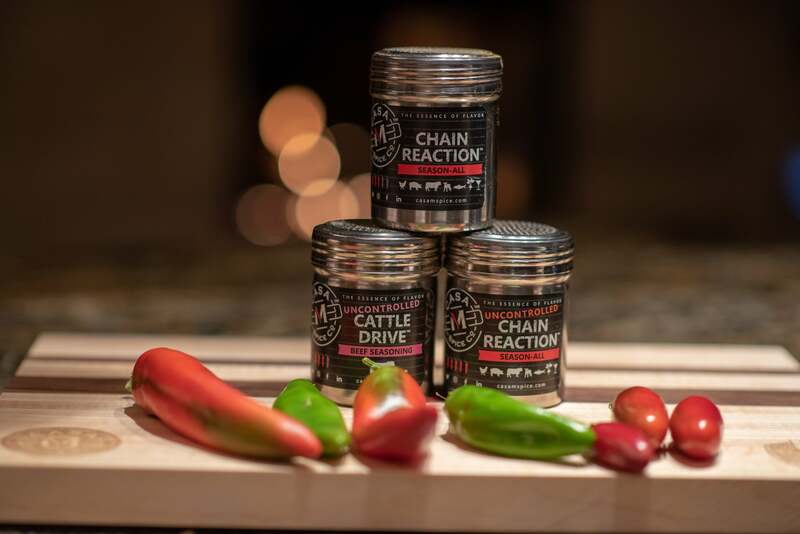 Add the Cattle Drive™ (or Uncontrolled Cattle Drive™), Uncontrolled Chain Reaction™, Chain Reaction™, ancho chile, and cumin and mix well. Add the tomatoes and their juices and mix thoroughly. If you prefer a thicker chili, this is your consistency. No need to add the beef broth. 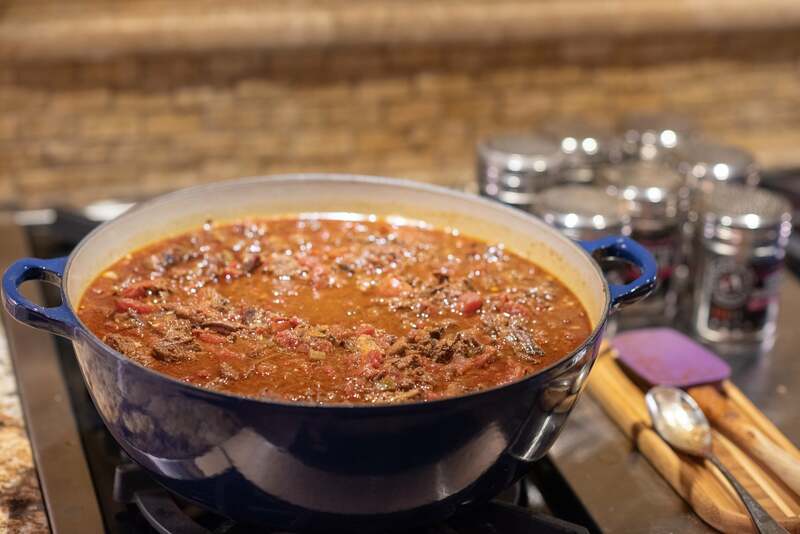 If you prefer a little more liquid in your chili, this is where you would add the beef broth to get to the desired consistency. Bring the pot to a gentle boil while stirring occasionally to prevent any sticking to the bottom of the pot while on a higher heat setting. Cover the pot and reduce heat to low/simmer (you want a little bit of a simmer going on, but nothing like a "boil" here). Simmer for 3-6 hours (as long as you have to let the flavors meld and develop). Uncover and stir once an hour or so and taste to fine tune the salt, pepper, and heat content to your taste! For salt, add more Chain Reaction™ a little at a time. For pepper, add more Cattle Drive™. For heat, add more Uncontrolled Chain Reaction™ a little at a time.